The buttons can come off, posing a choking hazard. The Chelsa dress is a girl's sleeveless sundress in sizes 2, 4, and 6. The top is white with green polka dots; the bottom is printed with a green and yellow floral design and has a multi-colored floral border at the hem. 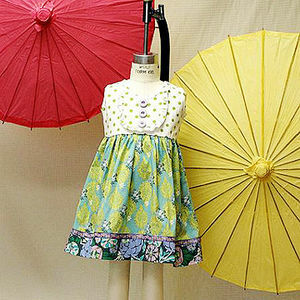 This recall involves about 1,500 dresses. In-home trunk shows and online from February 1 through February 25, 2011. Return the dress for repair or refund by contacting Matilda Jane Clothing. Call the company collect at 260-424-3511 or visit matildajaneclothing.com.